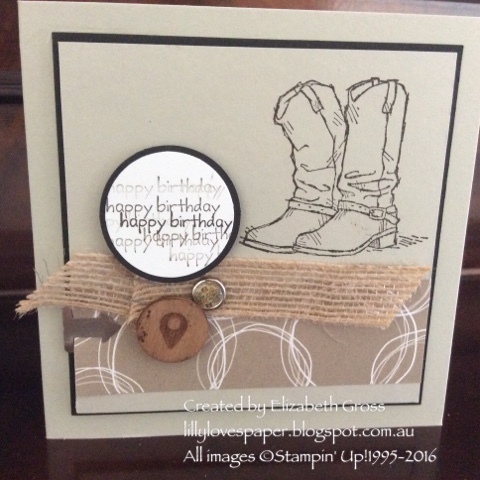 I have been having a little play with this new stamp set. It's pretty easy to use. The Serene Scenery DSP is great and easy to use here, with nature prints on one side and geometric patterns on the other. The sentiments are all from retired sets and the bits of hardware are from my stash - still using up bits and pieces lying on my desk!! If you are hoping along you may have come from Judy, so welcome. If you are starting here be sure and hop all the way around. 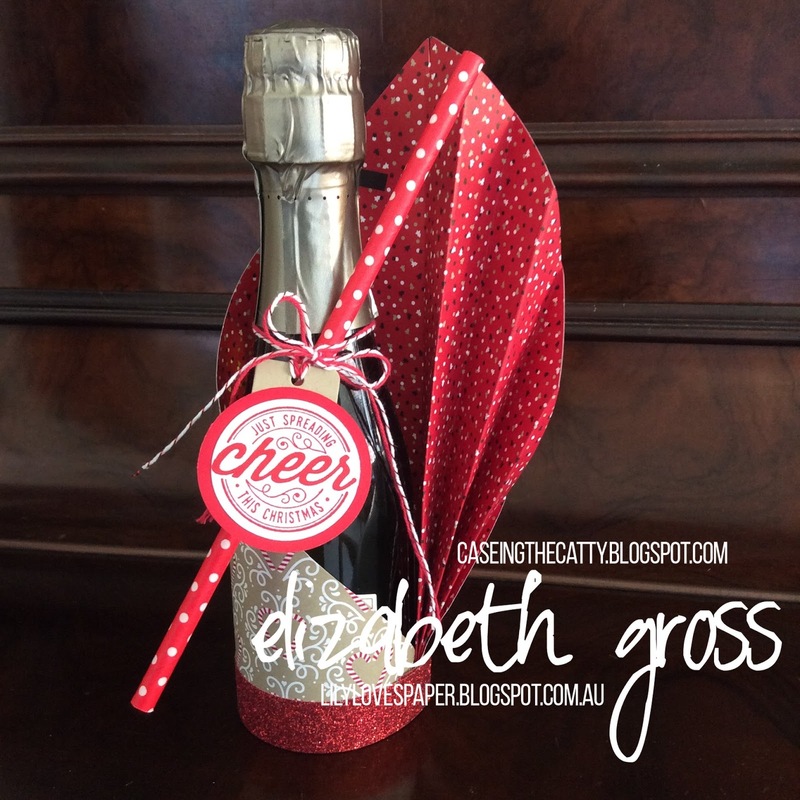 Well if you have been following my blog lately you'll know that I'm quite taken with the Here's to Cheers bundle!! the wine bottle tags Cheerful Tags Frameleits and matching stampset are super cute and easy to use. there's some great images on page 38 and I used them as a starting point. 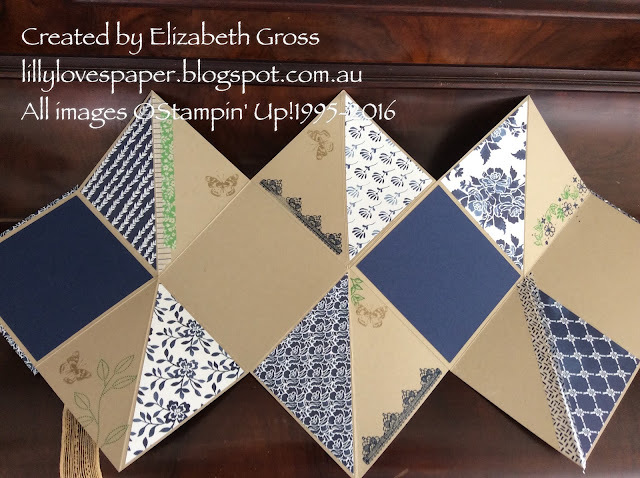 This cute set is for a birthday present, and I cut the silver swirl panel in half and simply spread it a little wider under the navy circle. 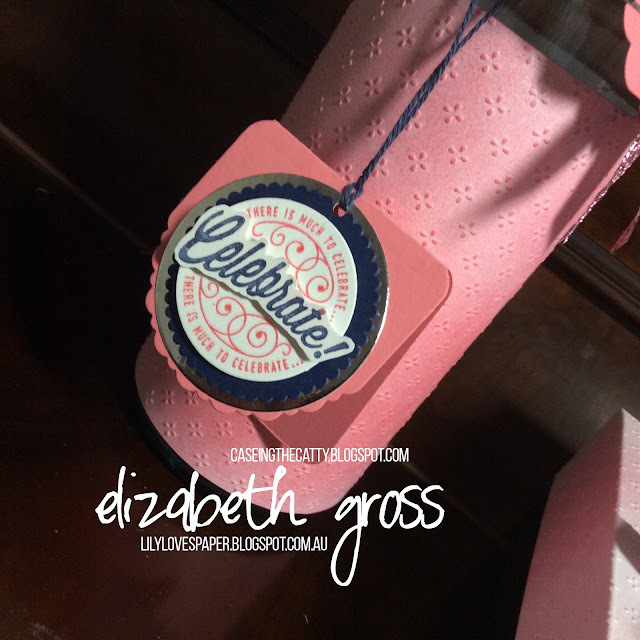 For the hanging tag I stamped in pink, clear embossed over this and stamped a second image and cut out the Celebrate in navy and layered it up on top. I used my sponge brayer and coloured the gorgeous textured white card with Flirty Flamingo and cut a strip to cover the label. For the box I made a new lid with the Fancy Frost Specialty Design Series Paper. I used less colour on this piece. 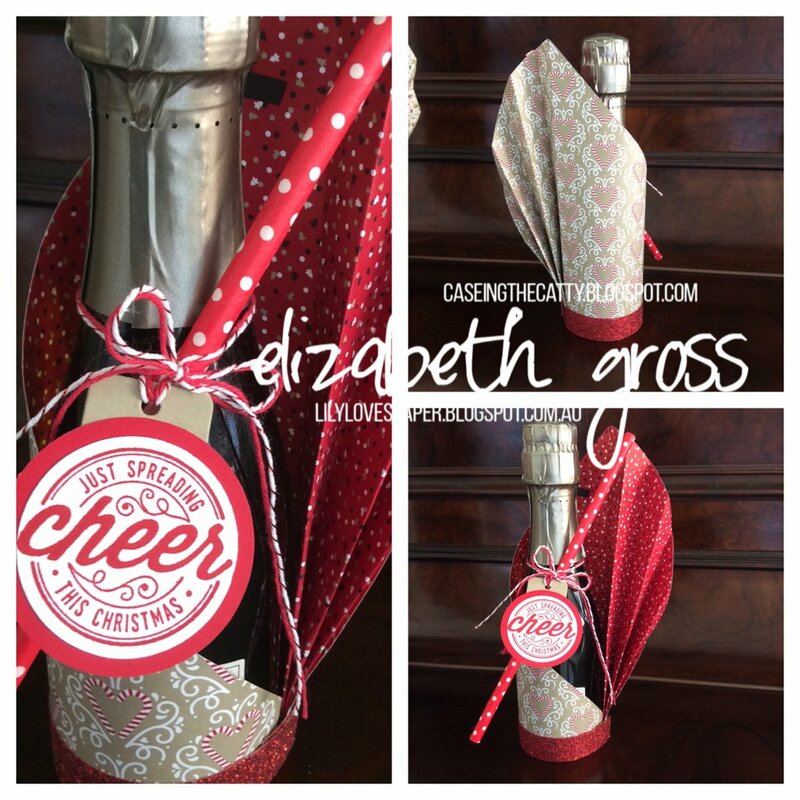 I used the same wine bottle tag and CASE'd the wrapping on page 38. It was dead easy! 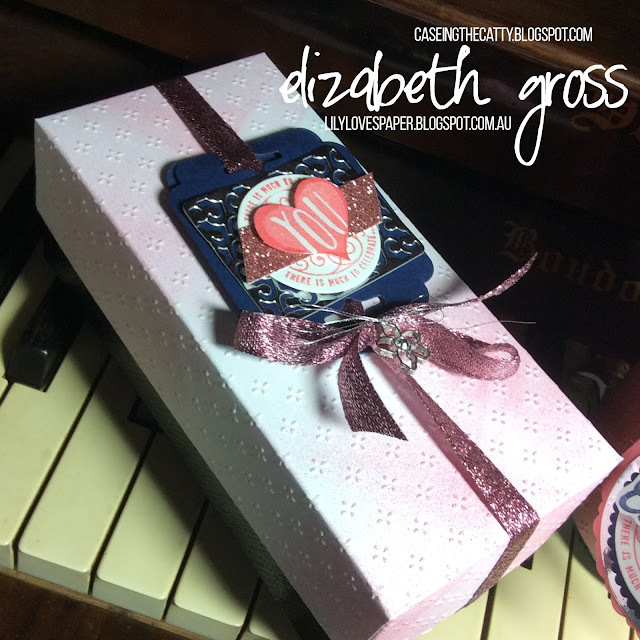 The pink heart is from the Oh happy day set. And just because I ordered the Cucumber Crush Mini striped ribbon for the first time and it arrived this week I thought I'd whip one up in green and copper too! This ribbon is gorgeous, i was worried that it would be too bright but it's perfect. A little tip here - I punched 2 mini holes in the tag and tied the pinecone on to the card before I added the white sentiment and before I threaded the ribbon through. I find a length of ribbon about 40cm works best. Next on the hop is Kathryn. She's bound to have something amazing! Just a few more snaps of some bottle tags I have ready for the markets. 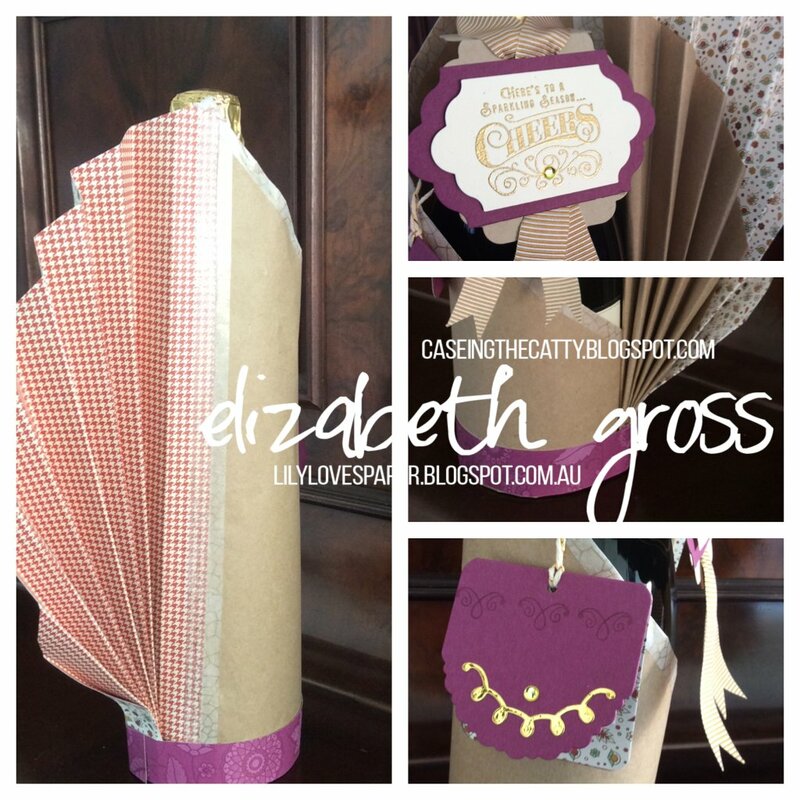 School Holiday Class - let's make a squash book! This is an old technique but lots of fun and can be a great gift, especially if you personalise it with photos. So Next Wednesday September 28 I will have two classes - 10 am or 6pm. 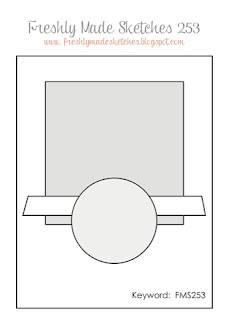 This is is folded and ready for giving on the bottom left. Here it is fully opened and ready for photos and messages. Hope you can join me - if you would like to make one on a CHRISTMAS THEME please let me know and I will have yours in Appropriate colours available. 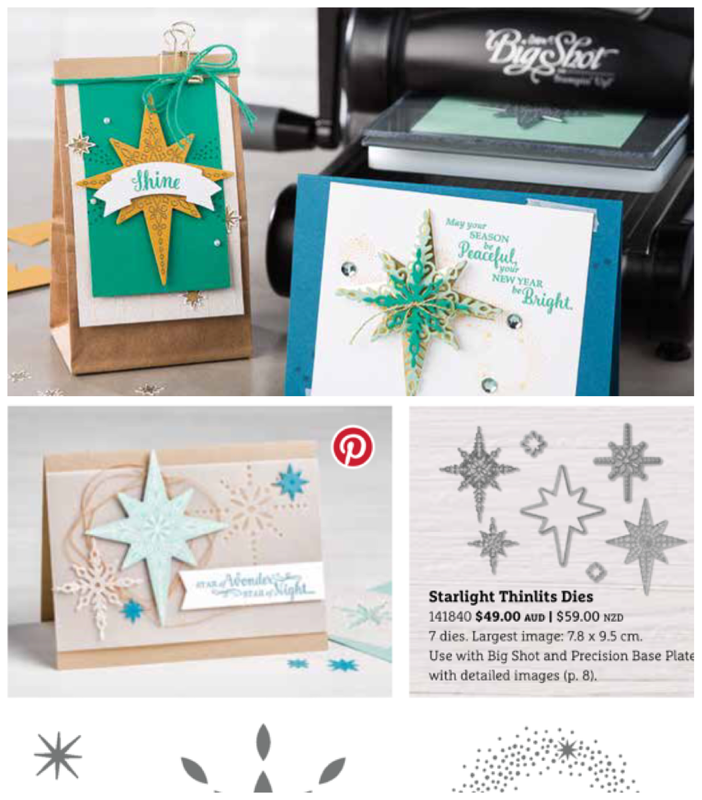 There are so many fabulous things you can make with the bigshot, it's hard to choose which fabulous set to play with. I don't have many of the new Christmas sets but that didn't stop me from taking inspiration and using what I already have! 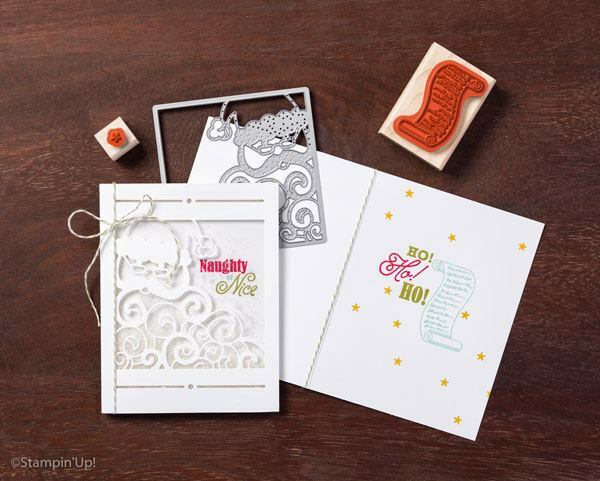 I have always loved Vellum run through the embossing folder - Textured embossing was one of the reasons I first fell in love with the Bigshot! It gives such a rich texture and changes the look completely with the new grooves becoming opaque. 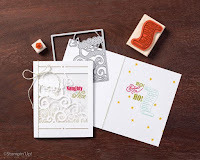 It looks particularly nice with embossing folders that have a lot of detail like lace. The Seaside folder is great because it has such a lot of visual interest that you don't need to have the strip perfectly straight, and secondly because when you to attach it to the card base you don't notice the strip of glue tape used . When you are using plain vellum you have to "hide" the glue points because they can show through. 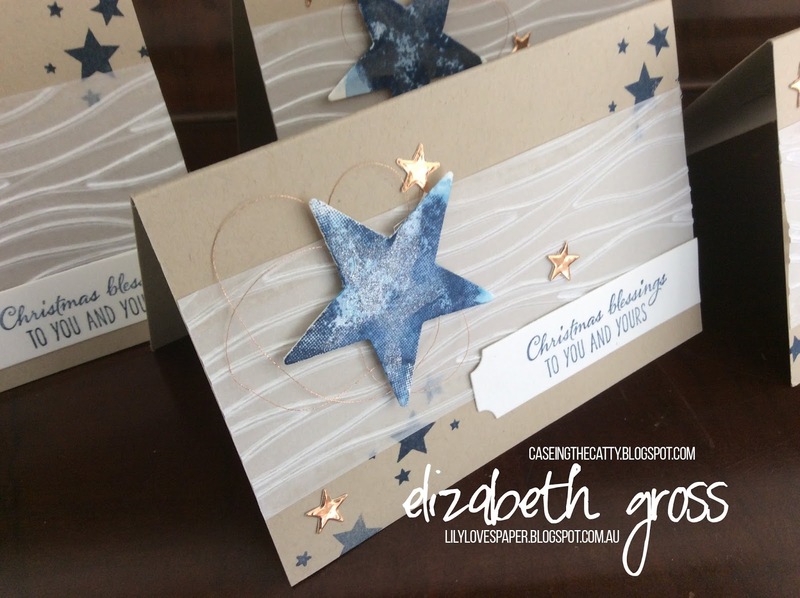 This set of cards needed to be quick to make so embossing was perfect!. 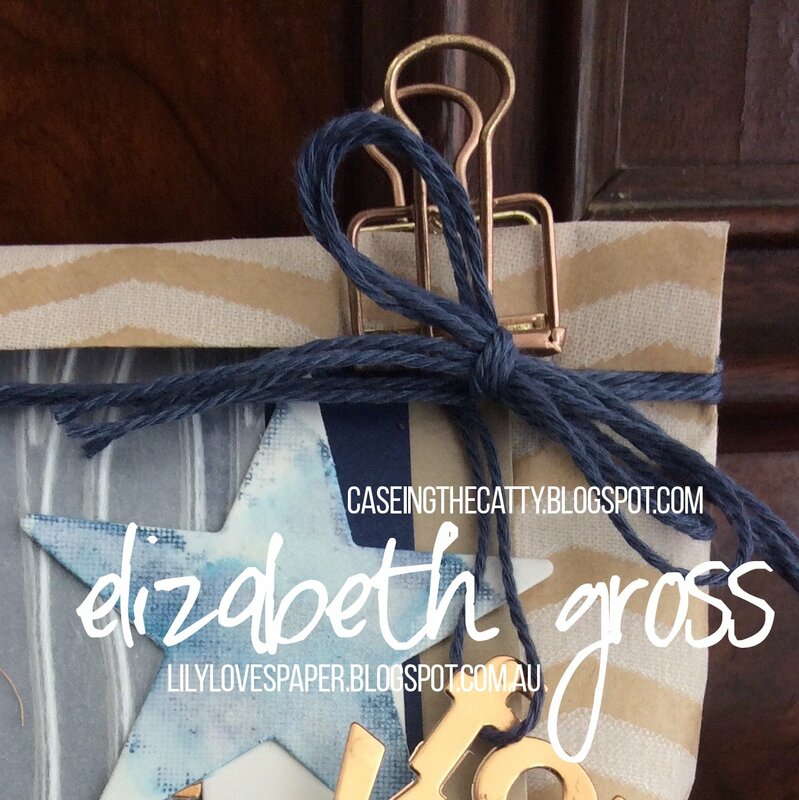 The stars are stamped in Night of Navy using the Perpetual Birthday Calendar. I also used the watercolour splodge image from this set to stamp onto Shimmer White Cardstock for the Stars. 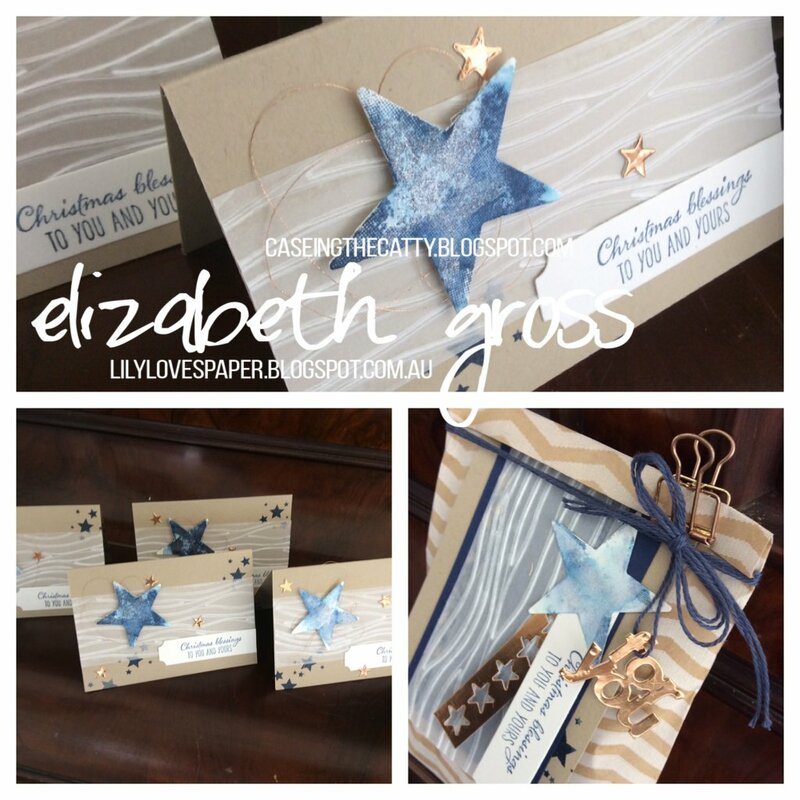 I cut the stars using the framelits from the Mini Treat Bag Thinlits- also the small copper star. I did wash over the stars with my aquapainter, and when dry added more sparkle with the gorgeous Wink of Stella. 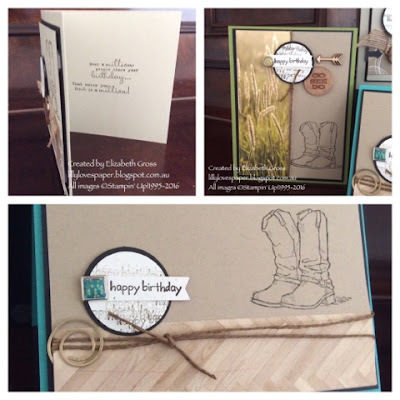 I also used the Note Cards and Envelopes to speed up the process! I realised too late that I hadn't ordered the Petite Cafe Bags in time, so my next option was to use a (retired) Kraft Tag a Bag Gift Bag. But this worked well enough. 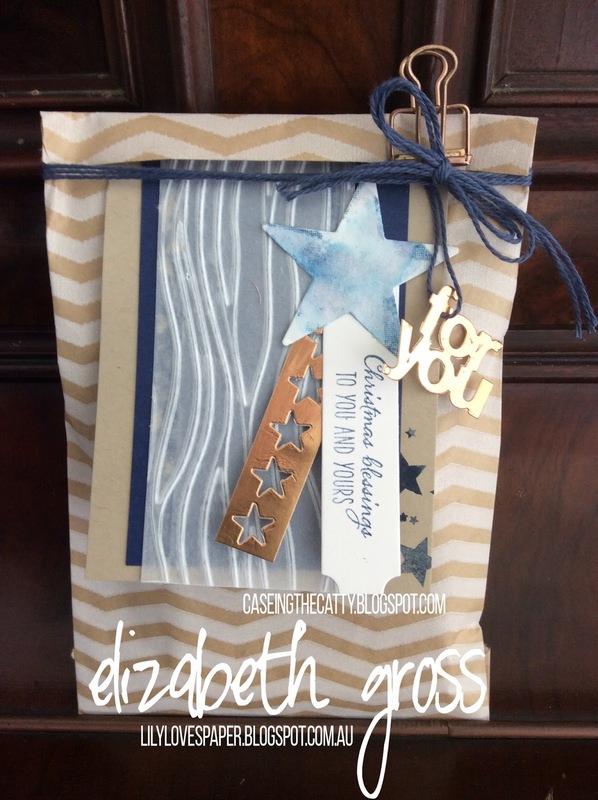 I decorated the front with the card elements and a few extra bits from the Mini Treatbag set, and I tied the top of the bag with the lovely solid Navy Baker's Twine. The gold binder clips are cute but since the rest of the decor is copper I decided to CASE Jess Williams (who we still miss at CTC) who this week heat embossed some of the little silver Christmas bells to turn them gold. 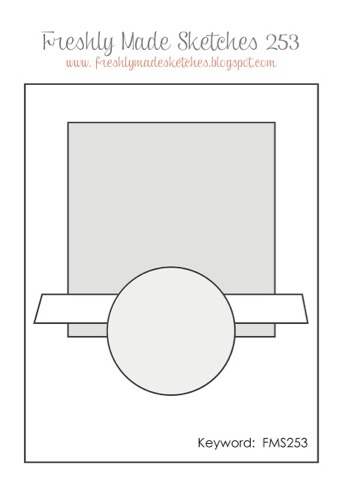 I have done this before with timber words, flat chipboard elements, Brads and even buttons but not with something as odd shaped as the clip. You definitley need a pair of tweezers for this one! 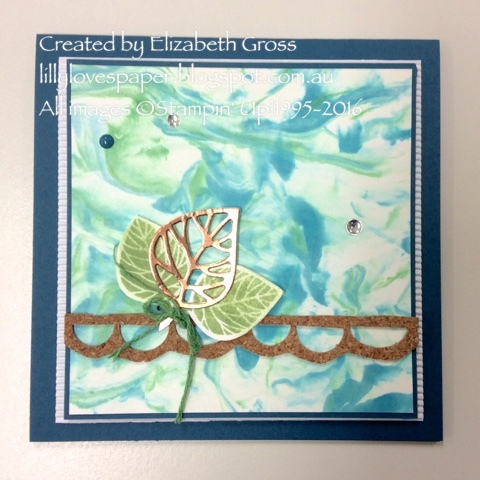 I covered the clip with versamark and copper embossing powder and heat set it. It's not perfect but looks quite cute and works well enough with this se - certainly looks better than gold!. Next on the blog this week is Judy. Be sure and hop all the way around. Don't forget we love to see what you create too, and we hold a monthly challenge where you can share with us. 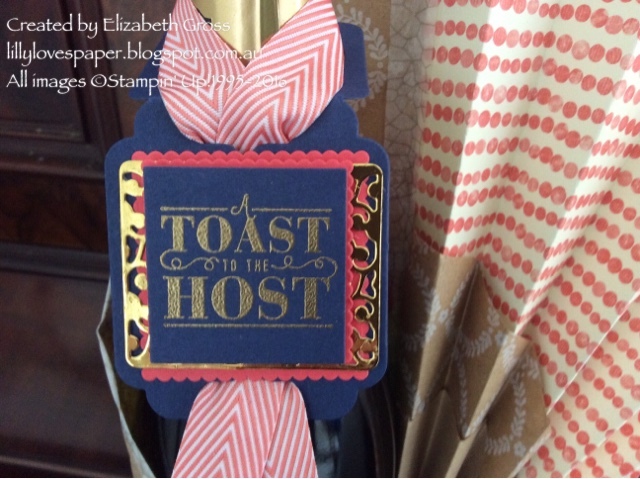 I am having so much fun making the wine bottle tags, so I thought I'd share one in the gorgeous colour combo for GDP #053 this week. You can see my other samples here at CASEing the Catty#95. I have to confess I couldn't find any large enough sheets of DSP with Watermelon Wonder so I've improvised with Calypso Coral for the Fan wrap, but the tag is Watermelon Wonder. 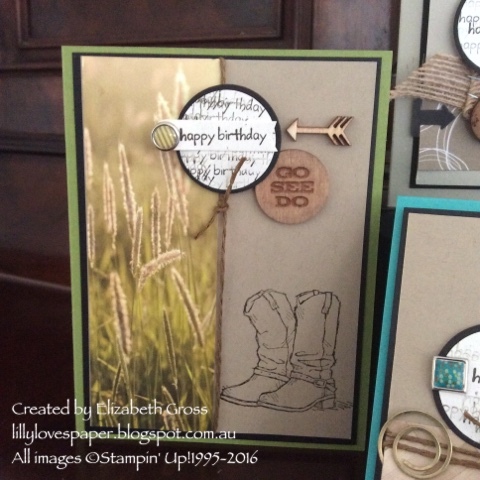 Don't you just love how all the Stamping' Up! colours tone together so beautifully? 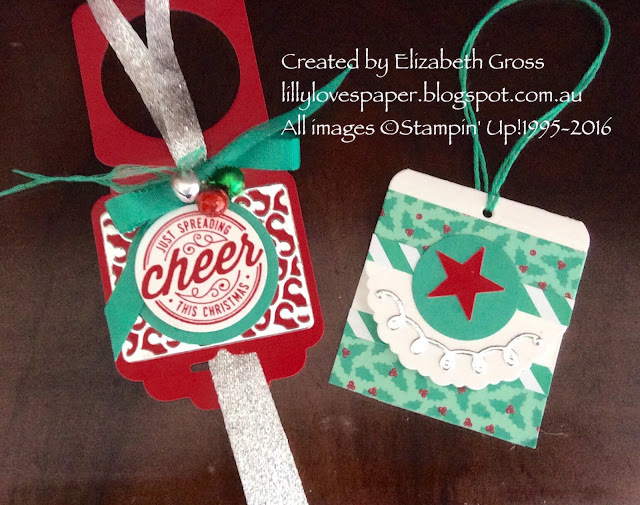 I did also discover that I've used all my Watermelon Wonder ribbon but the Chevron Calypso Coral came to the rescue. Navy ribbon would have been stunning too, and I did try the gold satin but it was a bit lost against the foil neck of the bottle. 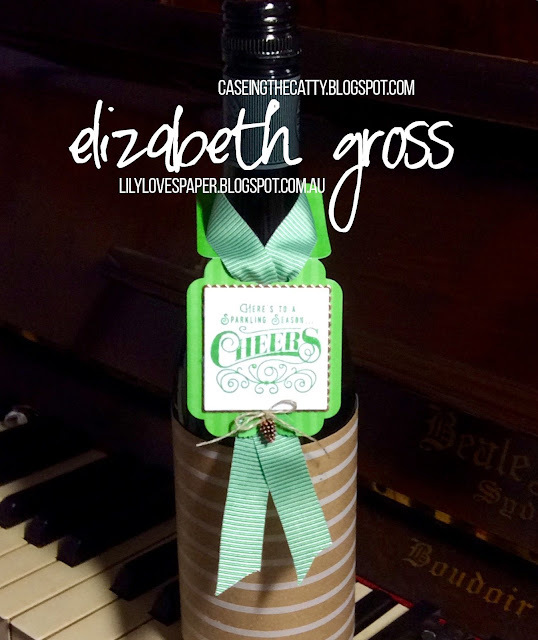 The Here's to Cheers wine bottle tag thinlits are so fantastic I love them. I like to add the extra tag as there's nowhere to write on the bottle tag itself. (There is a small circle of vanilla inside my folded hanging tag for a brief message) It is looped up through the wine bottle tag so it can hang or tuck in behind out of site as it is in the top photo. My friend is leaving Australia and asked me to make her some Thankyou cards. 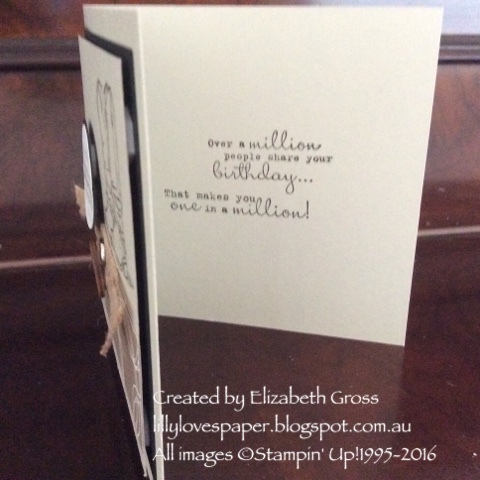 If you follow my blog you will know that my signature card is 41/2 square with a matching handmade envelope. 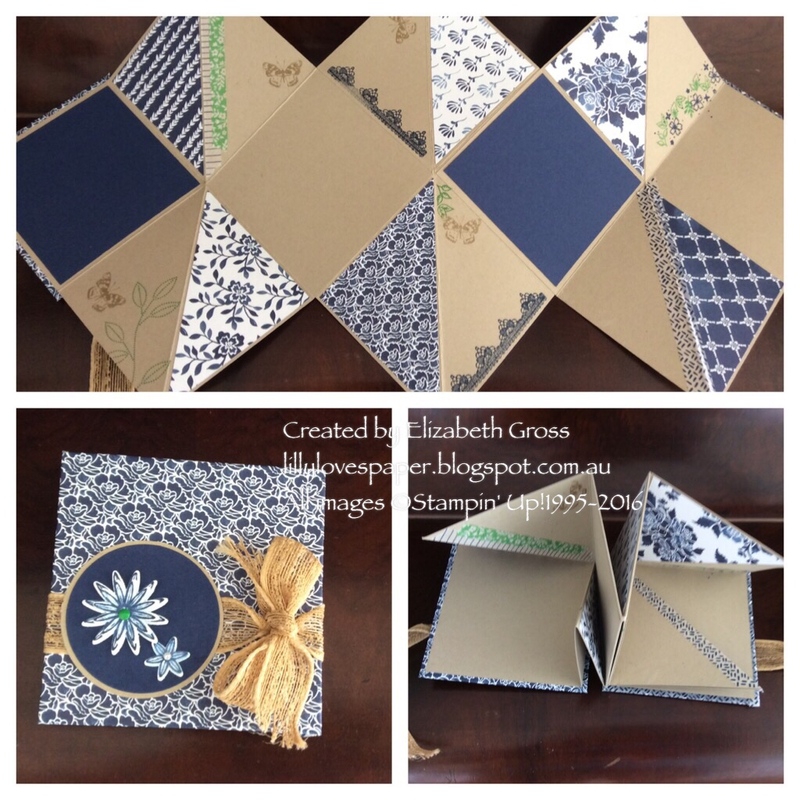 I found some 12 x12 DSP which is a perfect floral for the Swirly Bird set so I had fun putting this together. The sentiment is from Thoughtful Branches and is heat embossed in copper on a strip of vellum, and the cute little swirls on the envelope label are from the new set Here's to Cheers from the new Holiday Catalogue. I have been using it quite a bit, it's so sweet. 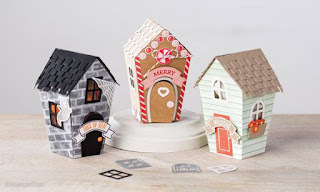 Welcome to the CASEing the Catty Sunday night bloghop where we use a section of the Catalogue to inspire this weeks projects. 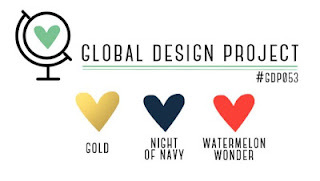 Designers can take a layout, a colour combination, or any element as the starting point to create something new. We invite you to tour around the hop and to join in -after all the Catalogue has so many beautiful samples to inspire us all. If you get lost you'll find the full crew here. The topic this week is favourite 3D item. Well that's such a big choice too. 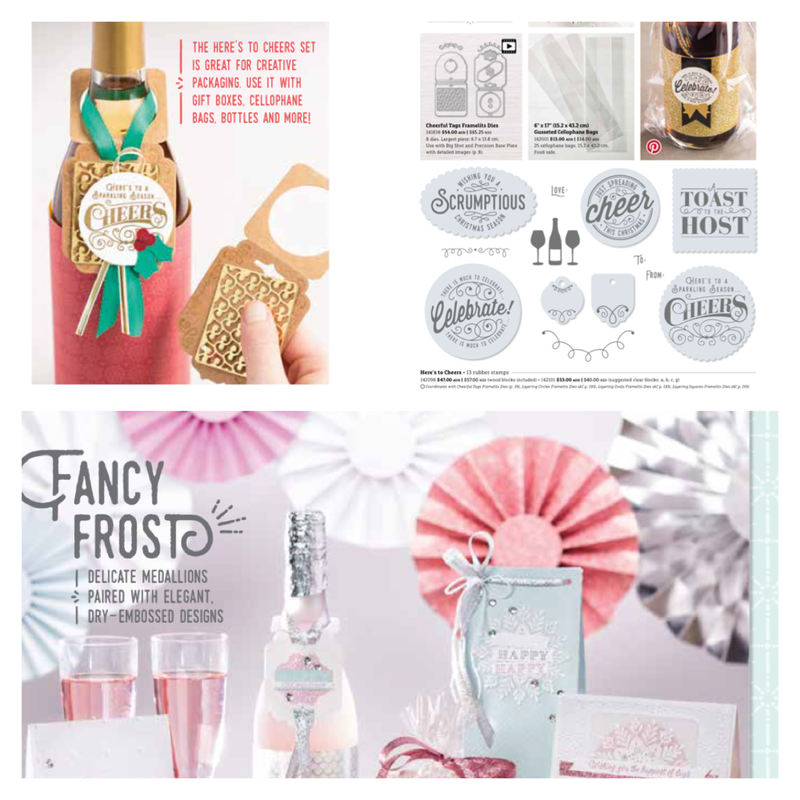 There are loads of 3D options in the new catalogue. In the past I have done this using heavy gift wrap paper but this time I used a Piccolo and some of the Candy Cane Lane DSP as the 12 inches width was sufficient. 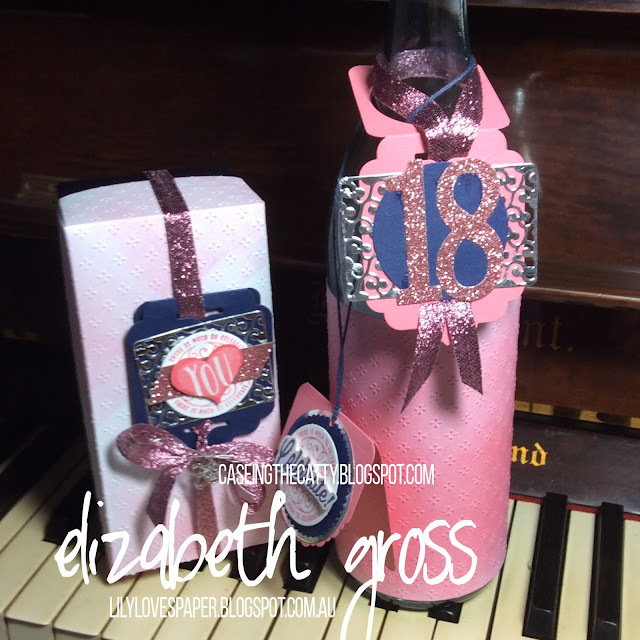 I used just the tiny folded tag from the framelits and adhered the two layered circles onto that as the bottle tag was just too big and detracted from the wrapping. The 11/2" and the 13/4" punches worked perfectly for this sentiment. The base is secured with a strip of Red Glimmer paper to just hold it all secure. For the full size bottle I needed to use regular wrapping paper - in this case the very wide roll of plain brown paper folded double. 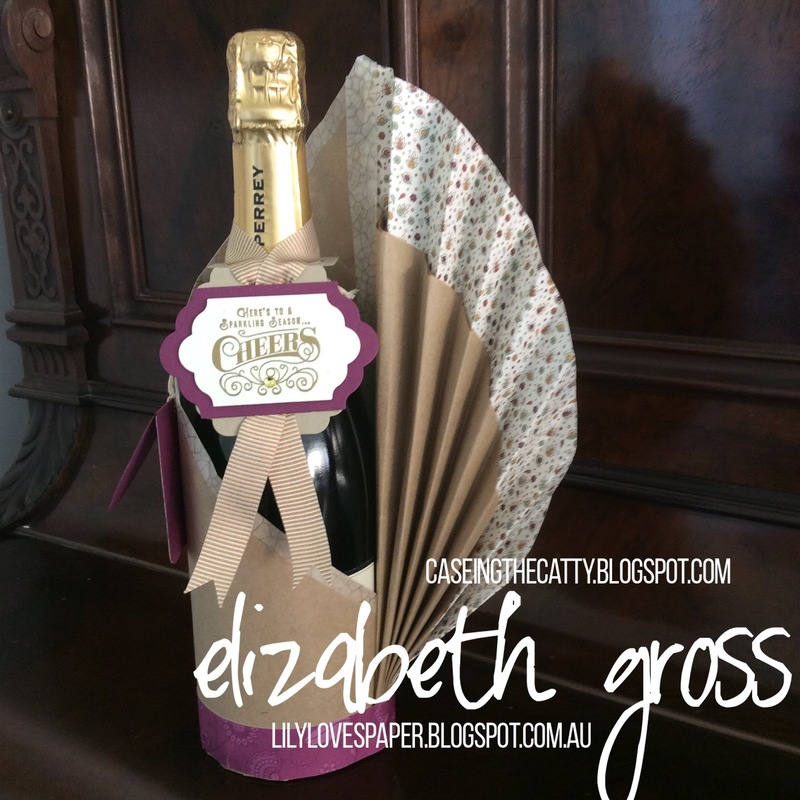 Heavy paper gives you a much better fan. 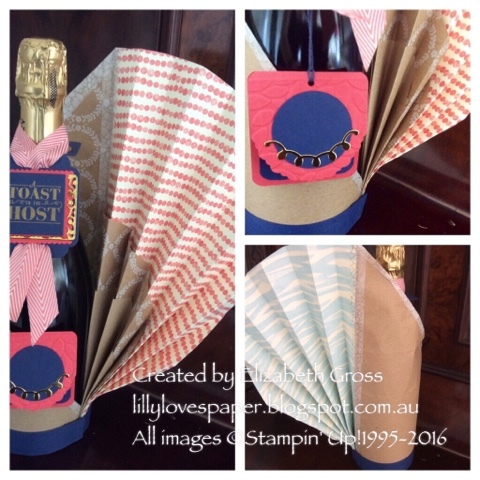 I used a full sheet of 12 x 12 DSP from the lovely Petals and Paisleys and attached it with some Washi just to the fan section of the paper. I trimmed the brown paper down to give a two layer effect. The wine bottle tag is such a simple mechanism to hold it secure. 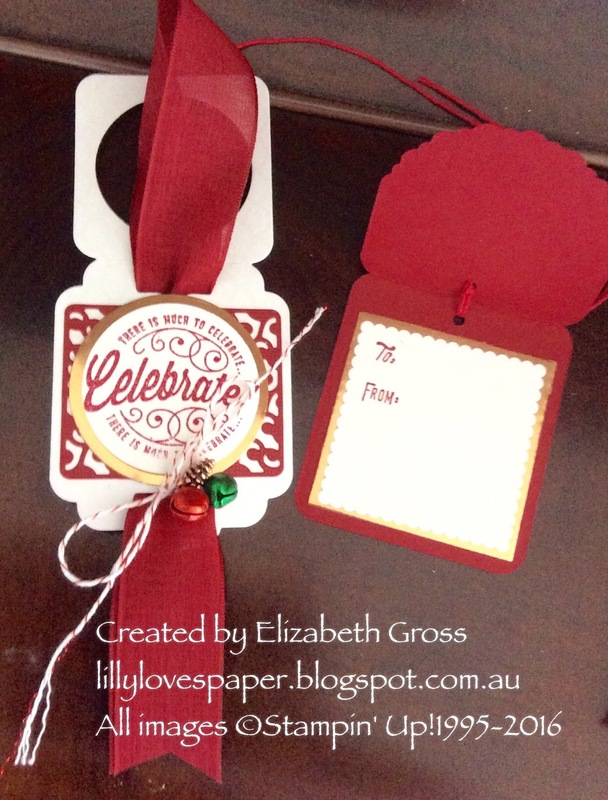 If the ribbon is wide enough you simply pull the ribbon tighter until it is sitting where you are happy with it. It can hang quite low or sit with the neck section more horizontal.There are so many lovely elements in the framelits I am looking forward to playing with it more. All the items I used are listed below and you can see them in more detail just by clicking on the picture. 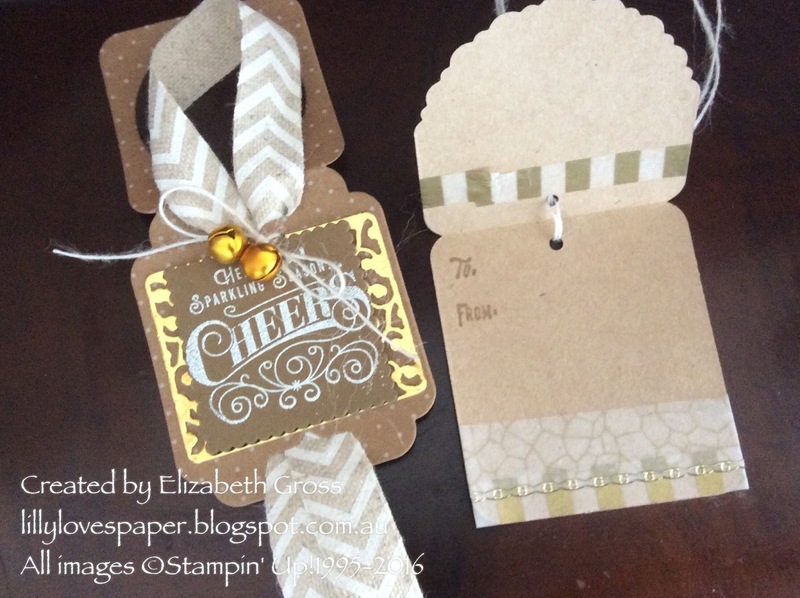 I made an extra tag so there's somewhere to write a little message, and I love the gold foil swirl cut using the thinlits too. Thanks for looking today, enjoy the rest of the hop, I can't wait to see what a range of 3D items we have for you. Next on the hop is Krissy Be sure and go all the way around. 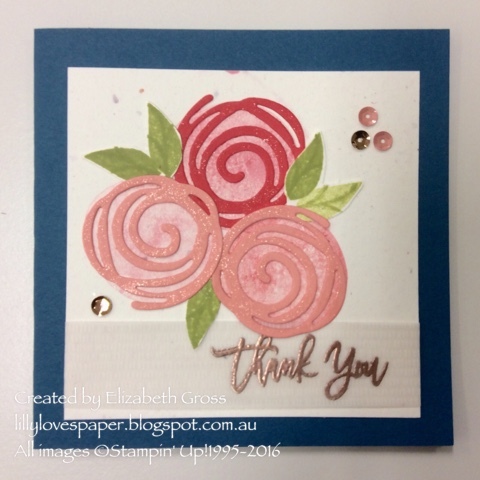 In an effort to use up bits and pieces (of which I always seem to have a ton) I put together this card using some remnants from a shaving cream marbling class that I held a while ago. 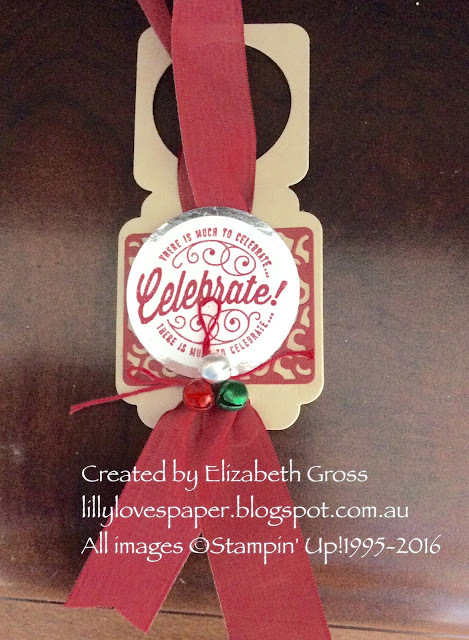 The stamped leaves are from Thoughtful Branches and were lying on my desk, and the cork remnant is from a very old Sale a Bration bundle. The card base is Dapper Denim and it is one of the few new products used here!!! 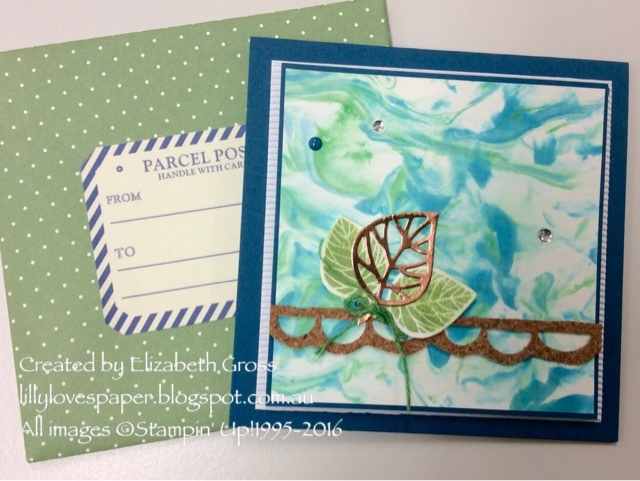 the other is the copper foil for the sihouette leaf (also thoughtful branches), and the enamel dots. My trademark handmade matching envelope is Wild Wasabi froma retired pack of DSP, and he corrugated White card is also retired. so I think I have done quite well using up quite a collection of old bits. the sketch from FMS worked well for this. I was asked to create a card for twins- a boy and a girl! How lovely. 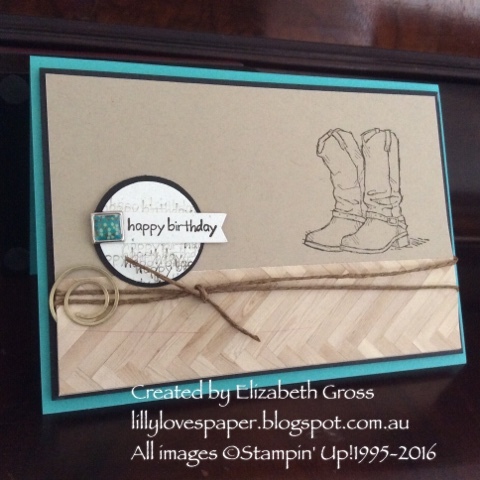 I'm not sure if this quite qualifies for the Stampin' Up! Only challenge to use Primary Colours#156 (of any tone,) since Green is not strictly a primary but I'm going to include it as my entry this week anyway. It just needs the green to soften it- and to me green is a basic colour which I use all the time! Lets call it artistic license! 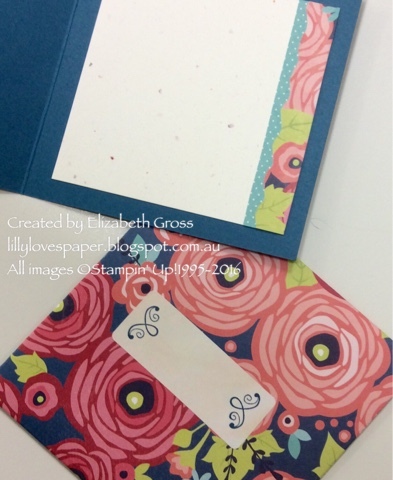 It's easy to create the background using the Irresistibly Floral DSP. Just add colour in patches and blend gently together, Keep gradually increasing the depth until you are happy with the overall look. 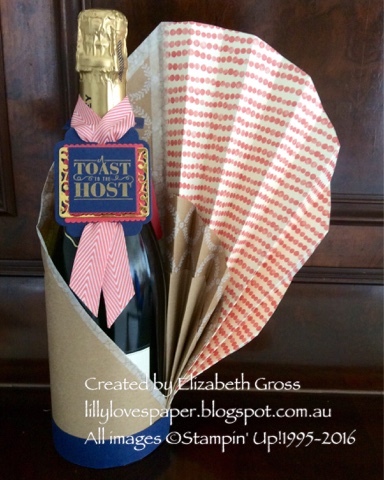 Wipe over with a tissue or soft cloth and the white design underneath shows through. 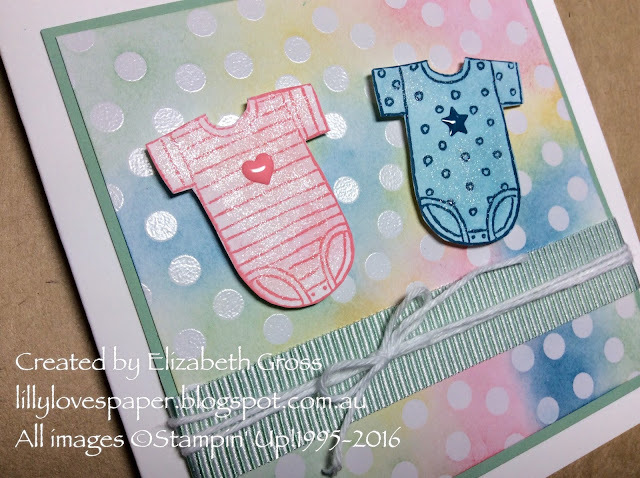 The paper pack has spots, stripes and florals and is super fun to use. The Mint Macaron Mini striped ribbon is perfect too. A little wink of Stella and some in-colour enamel shapes and this came together very quickly. Remember if there are any products you would like to order please click on the images below and it will take you directly to my online store.